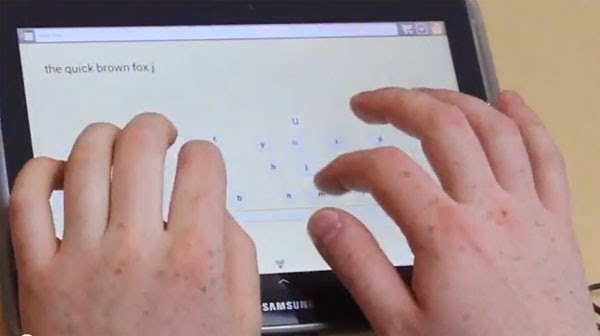 Dryft, a new keyboard layout for tablets aimed at faster typing, has been introduced. We just have a sneak peek of this amazing new keyboard. This is another great app from one of the creators of Swype, which is a hit keyboard app for Android phones. While Swype allows users to swipe their finger across the keyboard layout to type words quickly, Dryft does something completely different for tablet screens. A tablet screen can be too large to swipe a finger from one end of the screen to another. Dryft tries to help in this by allowing a user to use both their hands to type on tablets. With tablets it has always been impossible to type as fast as with keyboards. In a keyboard, at first a person can easily rest their fingers on the home row keys (ASDF and JKL;). Then they can move their fingers and press on the keys to type as quickly as they can. When we try the same method in a tablet, resting our fingers on the home screen keys is almost impossible. Even if you manage to do so, resting the fingers themselves bring up the keys as typed which is not desired. What dryft does is try to fix this problem. When you put fingers of both your hands in home row position, dryft keyboard automatically forms around that position with your fingers exactly placed over ASDF and JKL;. It does not automatically type when you just rest your fingers. Dryft is smart enough to figure out the rest position and the typing motion. When you move your fingers on the screen just like you are typing on a keyboard, Dryft does the magic making words and sentences form. This is a revolutionary way of typing in tablets which can really speed up and increase our productivity. Dryft keyboard is not yet available. A beta version is also not available yet. But it would be great to get our hands on this amazing keyboard for tablets. If you are interested, you can sign up in the official website for the beta program. You can also watch these videos to see how dryft works.